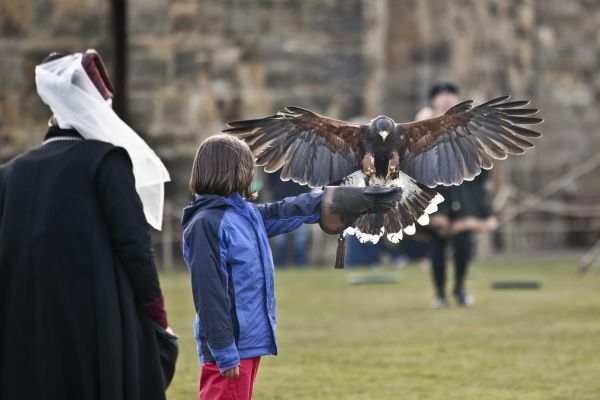 Witness an exceptional display of medieval falconry, worthy of entertaining the old Earls of Northumberland, from two of the country’s finest historical falconers. Experience a theatrical performance of expert falconry, combined with enchanting storytelling and inspiring history, which is sure to thrill and entertain the whole family! With an extensive knowledge and a passion for historical interpretation, Raphael Falconry’s performances represent an authentic reproduction of falconry from the medieval period. Watch in awe as these spectacular birds of prey swoop, soar and glide seamlessly from rampart to roof, all whilst discovering more about when and why hunting with birds was established in England’s Middle Ages. Learn of their popularity not only with the important figures of days gone by, but widespread growth and subsequent usage within medieval culture. Raphael Falconry hold more than 45 years of combined falconry experience, with specifically 20 years in heritage performances of superior quality. Raphael Falconry’s bird of prey performances draw upon meticulous research to present a captivating and realistic insight into the world of English falconry. These captivating performances are free with admission to Alnwick Castle! Please check the ‘What’s On’ board upon arrival for show timings and locations as these can vary throughout the season. Castle ticket must be bought to attend this event.